I already showed this statue to you, but I never get tired of it! It shows Henri IV, a French king that reigned until 1610, when he was murdered by what you may call a "terrorist", even though the term probably did not exist at that time! 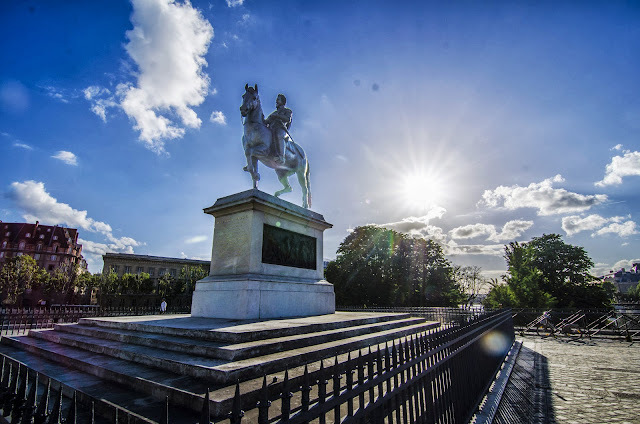 This statue can be seen on the Pont Neuf and it's definitely a must see. Mrs. Vandertramp said it - this is spectacular. With the sun at his back Henri IV and his horse look like they are about to leap off the pedestal, and that touch of purple on the building to the left is beautiful.